The Lincolnshire Vintage Vehicle Society’s museum has been in existence since 1959. The date in early November is now established in the ‘Rally Calendar’ for the excellent Open and Running Day put on by the members of the Society. In 2014 this was Sunday 2nd November and it was attended by the independent transport videos cameras for the first time. Our cameras were in place at the start of the day as the buses and coaches arrived and departed from Pyke Road and ran along Whisby Road where the Museum is situated. It is 30 years since the Leeds bodybuilder, Charles H. Roe, closed its doors and this event commemorated the fact with the running of many preserved Roe bodied vehicles. Lincoln Corporation indeed operated Roe bodied vehicles from 1941 to 1970. We see examples from Grimsby Cleethorpes Corporation, York Pullman, Leeds City Transport to name but a few. Lincolnshire Road Car is also well represented with Bristol / ECW buses in the shape of a K, SC, FS and two VRTs running in service, as well as an RELH coach, Bristol L and an MW bus on display. The buses on display were exhibited at various sites near to the museum and can be seen on this programme. Our first ride of the day is on board former United Counties Bristol KSW6B, 964 (KNV 337) with lowbridge ECW bodywork. We travel out to the Lincolnshire lanes for a photo shoot with this fine vehicle. After returning to the display area at the museum we film more action before joining former Leeds City Transport AEC Regent V, with Roe H70R bodywork. Numbered 952 (952 JUB) in the Leeds fleet, this bus has been restored by the museum in the guise it wore in the early 1970s as Tyne & Wear PTE 413 – carrying these fleet names on yellow panels as well as a yellow radiator cowl. This ‘musical’ bus takes us to Lincoln railway station where we see a former Darlington Corporation Roe bodied single deck Daimler Fleetline 27 (VHN 527G) and the arrival of Eastern Counties Bristol Lodekka LFL57 (557 BNG) and Lincolnshire RCC 2115 (DBE 187) a highbridge bodied ECW Bristol K6A. 2115 is our transport back to Whisby Road. As darkness falls the atmosphere becomes quite magic as the tungsten bulbs glow in the dark and the crowds of passengers line up for the evening city tour to the ‘Cathedral Quarter’. 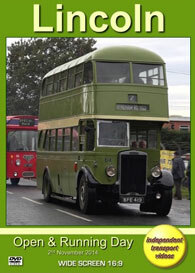 We board Lincoln Corporation 64 (BFE 419), a 1941 Leyland Titan TD7 with Roe H56R bodywork. Our camera takes up its position on the lower deck where we enjoy the sounds of this superb vehicle as it climbs the hill towards the cathedral. Fully loaded it arrives at the cathedral in time to see Grimsby Cleethorpes Roe bodied Daimler CVG6 57 (NAT 766A – TJV 100) arriving behind it. We then return to the Museum ‘park and ride’ stop to complete our day in Lincoln. A big thank you must go to all the people involved with organising this excellent event. We hope you enjoy our programme! Duration : 69 minutes (approx).